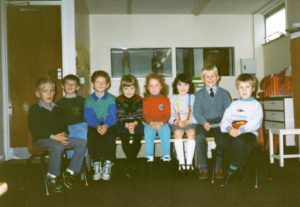 Colour photograph of the Primary 1 Gaelic class in 1992. If you know the names of the children, please let us know. 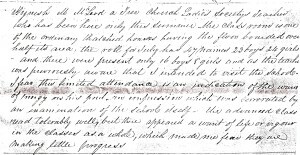 Photocopied pages from the annals of the Celtic Society, 1836, in which Rev Neil MacLean, minister on Tiree, reports to George Farquharson, Secretary to the Celtic Society in Edinburgh, the results of the Celtic Society competition for school children on Tiree and Coll. Prize books were awarded for proficiency in arithmetic, writing, english and gaelic. 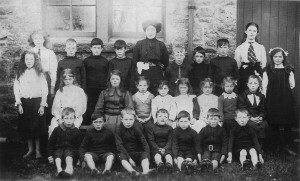 The winning scholars on Tiree attended Kirkapol School – Malcolm MacDougall, Archibald MacKinnon, Donald MacLean, Donald Clarke and Ann MacKinnon; Heylipol School – Allan Campbell, Robert MacFarlane, Flora MacDougall, Christina MacLean, Donald MacIntyre and Catherine Campbell; Hynish School – Allan MacDonald and Hugh MacKinnon. The scholars’ fathers’ names are also listed. 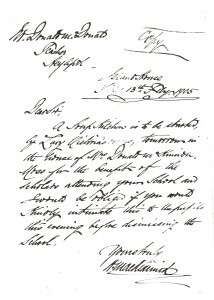 Two merit certificates from the Scotch Education Department for Jessie Ann MacDonald, Milton, while attending Ruaig Public School, in 1893 and 1895. Tragically, Jessie Ann died at just 18 years old. From a collection of items found in Milton Cottage, Caoles. Portrait photograph of Kenneth Nisbet Mure QC (1947-2016) in barrister’s wig and gown. From the estate of Robert Nisbet, Heanish. 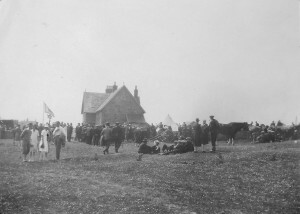 Kenneth Mure’s mother lived on Tiree, and while he lived in Giffnock, he retained a holiday home on the island. 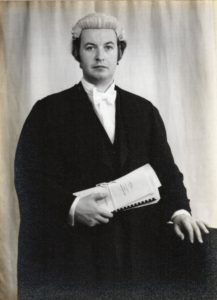 Graduating from Glasgow University, he was qualified in both Scots and English law, and was an expert in revenue and property law. Mr Mure became a highly respected Advocate for Scotland in 1975, and took silk as a Queen’s Council for the UK in 1989. 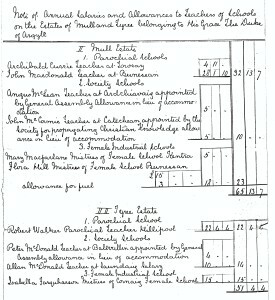 Record of Work for Cornaigmore School 1970-1974 in three volumes: (1) English, Environmental Studies, Arithmetic, examples of work by primary school children and summaries of their abilities (1970-71); (2) Modern Studies, History, Geography, Arithmetic, Algebra, Physical Education, Leisure Activities (1973-74); (3) Primary 1-5, numbers, sound, mathematices, English, (1973-74). School Summary registers for Cornaigmore Secondary School, 1965-1993, listing date, class number, number on roll, number of abscences. Does not contain pupils’ or teachers’ names. Eight volumes. Class Summary registers for Cornaigmore Secondary School, 1971-1991, containing abstracts of daily registers and term summaries, listing date, class number, number on roll, days open, possible attendances, number of abscences. Does not contain pupils’ or teachers’ names. Thirty volumes. Small hardback book ‘Chemistry’ by Prof. Roscoe, 1876, from the Science Primers range of books for use in schools. Hardback book ‘Gaelic Scotland: The Transformation of a Culture Region’ by W. J. Withers, 1988. Covers the process of cultural change in the Highlands and Islands of Scotland, particularly during the seventeenth, eighteenth and nineteenth centuries. (Including policies of successive governments, the decline of the Gaelic language, and the Clearances.) Tiree mentioned pages 8, 181, 209, 214, 219, 225, 241, 285, 357, 359, 373-5 & 380.